Are you a designer, contractor or homeowner who desires a truly unique look or custom finish for your kitchen? 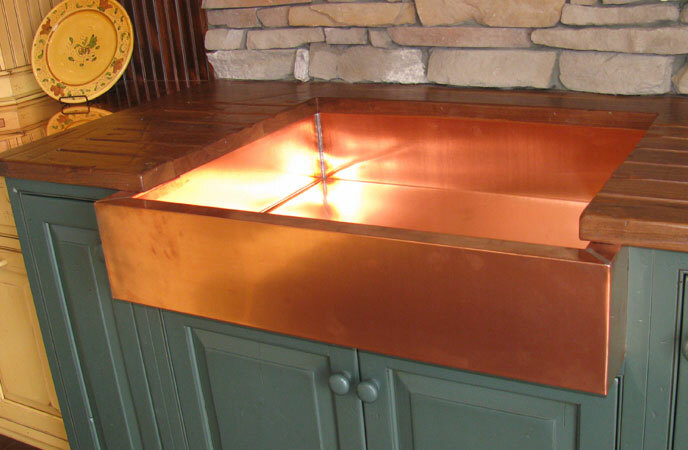 From stainless cabinet doors and copper sinks, to unique back splashes and more. From classic to trendy works of art that showcase your unique style in copper, stainless and other metals. Are you looking for custom roofing parts or architectural moldings for a special roofing project? Whether you're looking for commercial ES-1 edgings, parts for historic restoration, or custom gutters and downspouts, we can fabricate the parts you need to your exact specifications! Work with us for fast turnaround times and precise fabrication you can count on for every project! Whether you need custom duct work and fittings, custom adapters, wall caps or piping, Horst Sheet Metal can custom-fabricate the parts you need to complete your HVAC project. At Horst Sheet Metal, custom metal fabrication is our passion! We're here to bring your ideas to life! Whether you're working on an historical building, or want to create something truly unique that hasn't been done before, we have the experience and the vision to make your dreams reality! We Have the Tools, the Experience and the Vision to Bring Your Metal Fabrication Projects to Life! Whether you need to duplicate historical moldings or finials, want to add a unique range hood, back splash or countertop to a custom kitchen or need custom parts for a special roofing or HVAC project, you can trust Horst Sheet Metal for precise, light-gauge metal fabrication for your every need. We combine the best handcrafted processes, passed down through the generations, with the latest computerized, CNC and laser technology to produce truly custom metal kitchen accents, roofing parts, HVAC solutions and custom projects all created to your exact specifications. We work with homeowners, contractors, kitchen manufacturers, designers and architects to bring unique projects to life! Bring us your ideas, your drawings or your vision and find out how we can make your dreams reality.